Stamp out 12 circles with a fluted cutter (I used 9cm) and press into a greased bun tin. In the bottom of each, add 1 rounded tsp jam and spread evenly. Whizz cake in a processor to form crumbs and put in a mixing bowl with flour, butter, ground almonds, caster sugar, eggs and almond extract. Beat until smooth. Divide between the tarts to cover the jam. Scatter over some flaked almonds on each. Cover loosely with foil and bake for 30 mins until golden, taking off the foil half way through. 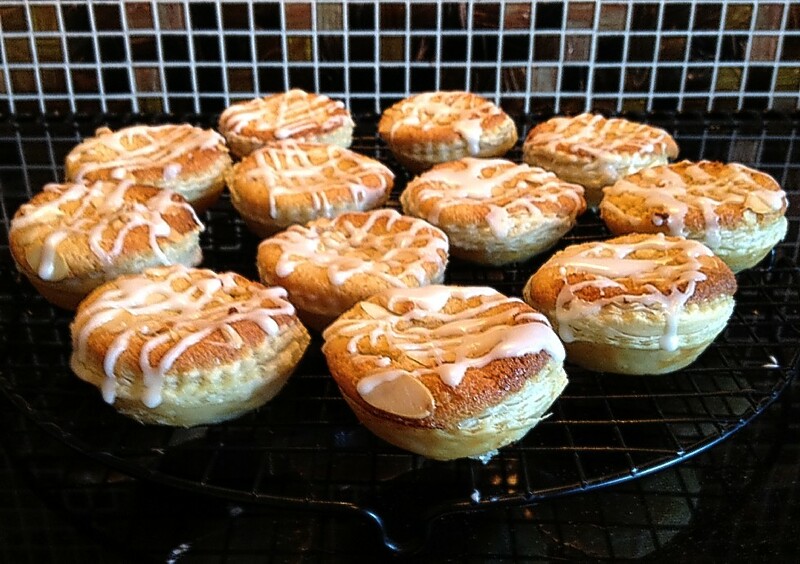 Cool the tarts, then add a splash of water to the icing sugar in a small bowl and with a teaspoon, drizzle patterns on the top of each one and leave to set. The original recipe called for cherry jam, but I used strawberry in this picture and also think raspberry would go well too. If you like lemon curd, use that, because they are delish!! !